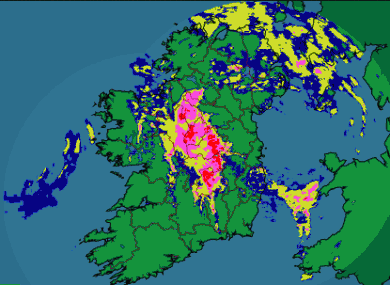 THE SPELL of warm weekend weather has come to an abrupt end across the east coast and the midlands this morning, as Met Éireann warns of heavy thunderstorms in those areas later today. The service says the storms should hit in mid-morning, but clear later in the day to make way for some sunny spells. There’ll still be occasional showers coming in from the south-west, though, particularly in the midlands – with still some occasional storms. Elsewhere, however, the day might have gotten off to a deceptive start – because in the south and west it should be a try and bright day, with temperatures nationwide hitting somewhere between 17°C and 21°C. This evening will be dry, but further showers will emerge overnight to restore dampness to a mild night ahead of a sunny-but-showery Tuesday. The weather should have tempered down a little in time for Wednesday’s Olympic homecoming. How’s the weather where you are? Let us know in the comments. Got a photo to share? Share it with us: pictures@thejournal.ie. Email “Back with a bang: Thunderstorms to hit midlands and east”. Feedback on “Back with a bang: Thunderstorms to hit midlands and east”.